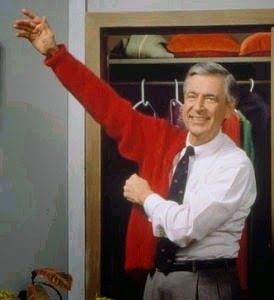 I sat and watched Mr. Rogers with my toddler this morning, and it brought back so many memories of my childhood. I used to LOVE that show and still to this day, whenever I think of how crayons are made, or where milk comes from, I think back on the 'how to' videos he used to show. Do you remember those?? But I digress, so what I started remembering was how at the beginning of every episode, I would try to guess which colored sweater he would choose from his closet. Ha, that was one of the highlights of my day! Wondering what color he would choose. If only my life now was that simple! Watching Mr. Rogers, eating peanut butter and jelly sandwiches, taking a nap and playing OUTSIDE. Preschool is such an innocent age. For the majority of little kids out there, there isn't much worry. With all of the drama on TV lately (especially here in Dallas), I realized how innocent young children really are and how much of this cruel world they have not gotten to know yet. As I was getting dressed this morning, I signed a big 'ugh' as I tried on my jeans and my post pregnancy tummy looked bigger than I remembered. I started thinking how my preschoolers don't know what 'fat' means. They think everyone is beautiful (and they are gosh darn it) but you know what I mean. My preschoolers have no idea what plastic surgery is. They think yellow pants and an orange and dark mustard yellow flower shirt goes together along with their red bow and are fully confident in going to school in that outfit. Preschoolers are okay with passing gas in public and talking about their 'vaginas' to complete strangers. They are okay with giving random strangers hugs and so TRUSTING. But on a darker note, they have no idea that planes crash, that there is a deadly virus called Ebola, that people can kidnap them and do cruel things. They think everything is sunshine and roses. When I turn around and see my little girls crying because one of them isn't sharing, I cringe at the thought that it is all they are worrying about today, meanwhile mommy watches that Isis crisis on TV at night. I have no advice here or real great insight, but I just love seeing their little innocent cuteness. I sometimes want to shelter them and have them finger paint and dig for worms all day. Is that so bad?